Josh Brolin does a pretty damn good Tommy Lee Jones in Men in Black 3. Good thing, because the actual Tommy Lee Jones is barely in the movie, and when he is, it seems he’d rather not be. By now, Jones can do the stoic, perpetually unfazed Agent K in his sleep, and that’s more or less what he does. Brolin is a different story. Playing a younger Agent K — in July 1969, where Agent J (Will Smith) has time-jumped to prevent an alien marauder from killing K — Brolin not only brings some Jonesian dry wit to the role but suggests a fresher, more optimistic K. He alone makes MIB3 a worthier sit than the previous sequel. Beyond that, there’s Smith doing his usual shtick as J, who you’d think would be used to extraterrestrial shenanigans after fifteen years, but who reacts to everything the same way he did in 2002 and 1997. J has somehow kept his humanity in his job, but how? How do you deal with surreal threats to Earth every day for a decade and a half and not turn into a jaded cold cod like K? The movie isn’t interested in that; it’s more concerned with its Moebius-shaped timeline, in which the alien villain (Jemaine Clement) seeks to kill K before K can implement a shield to keep the villain’s cohorts from invading Earth. J isn’t even supposed to interact with the younger K, but he’s forced to, and the movie doesn’t get into any possible catastrophic consequences that may result from J being in 1969 — or any benefits, either. There’s an intriguing character named Griffin (Michael Stuhlbarg), who sees all possible futures. I almost wanted MIB3 to break off and become a mockumentary about him — his butterfly-effect way of seeing life as infinite branches that can point to glory or doom based on whether someone leaves a tip at a diner. That’s the problem with the MIB movies — they serve up fascinating concepts, but they all take a back seat to the same chase scenes, the same shoot-outs with space-age weapons. Make-up wizard Rick Baker reportedly built a bunch of retro-looking aliens for the 1969 scenes, not that we get to see much of them. Mostly we’re stuck with Jemaine Clement’s Boris the Animal, who growls and shoots people with spines launched from his palms. There are two of him, too — the one from 2012 and the one in 1969 — so he gets tiresome fast. 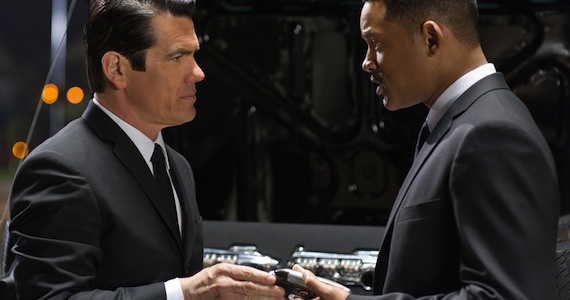 MIB3 reportedly cost $250 million, though it doesn’t look much more expensive than the earlier films. The 3D, as usual ladled onto the film after shooting ended, doesn’t help. At this point, I think I’d rather skip such post-converted 3D movies — generally you miss nothing by opting for the 2D screenings — and hold out for the ones designed for 3D and actually filmed in 3D, like the upcoming Prometheus. The script, by Etan Cohen and the uncredited David Koepp and Jeff Nathanson, tries for some emotional depth with the fatherless J looking fruitlessly to K for some caring and sharing, but once J gets together with the younger K that aspect gets lost, only to be rediscovered in a last-act twist. By that point we want to see J and the older K reunited, and we do, briefly, but there’s no weight to it. I suppose the point — and, for some, the appeal — of these movies is that they’re weightless romps. In theory, and with the cast of eccentrics the MIB series have attracted with a big paycheck, the movies should be nutball classics. But most often what they boil down to is Will Smith getting flung around by some giant beast, or Tommy Lee Jones smacking someone repeatedly with an alien fish. If that’s what hits your funny bone, bon appetit. The hip, knowing backdrop of the films — their winking acknowledgment that what you suspect about aliens is true — is more interesting than the run-of-the-mill plots scampering around in front of it. 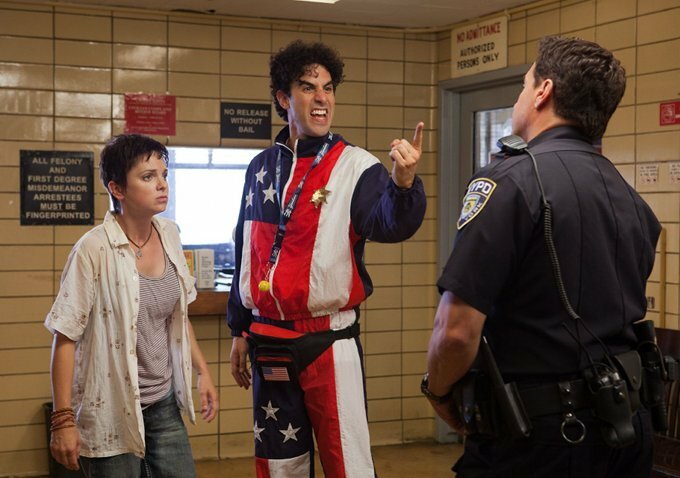 Most movie stars would die without a script; Sacha Baron Cohen may be the rare actor who works best without one. In Borat and Bruno, Baron Cohen disappeared inside offensive foreign characters and then let them loose on America, interacting with actual people and recording his findings. The Dictator is different in that it’s a scripted narrative (by Baron Cohen and three other writers) about Admiral General Hafez Aladeen (Baron Cohen), the capricious and preening ruler of the fictitious Wadiya. Through circumstances too contrived to bear repeating, Aladeen comes to America, is stripped of his signature beard, and finds himself powerless and anonymous on the streets of New York. How will this dictator, accustomed since childhood to having his every whim satisfied, adjust to life as just another immigrant shlub? One problem is that he doesn’t really have to. The script could have gone one of two ways: either he goes the Henry Hill route and lives the rest of his life like a shnook, or he somehow bends his surroundings to his will even without the support of the state. The Dictator opts for the second way, and though it seems fresher at first glance, it allows for very little shading for the character, comic or otherwise. Aladeen is pretty much one-note throughout; so were Borat and Bruno, though the structure of their films mitigated the characters’ lack of growth — indeed, part of the fun was in watching the unpredictable reactions of real people to these unchanging, predictable characters. Baron Cohen and his writers give Aladeen some quirks but don’t do much for the supporting characters. The result is a lack of any real comic tension between Aladeen and anyone else. Needing a way into the United Nations to switch places with his double before the double can declare Wadiya a democracy (I told you it didn’t bear repeating), Aladeen goes to work in an earthy-crunchy organic food store managed by the super-p.c. Zoey, played by a nearly unrecognizable Anna Faris with short black hair. Aladeen falls in love with her, and while the reasons for that are cleverly worked out, we mostly have to intuit that he’s pleasantly shocked by the very notion of a woman who speaks her mind (or, indeed, has one and is allowed to prove it in front of men). As for what Zoey sees in him, your guess is better than mine; she seems to bond with him while helping him deliver a baby, a script decision considerably less sexist than what Aladeen takes for granted, but still pretty sexist. Ah, gals will always go mooshy around a baby. The Dictator cribs a lot from Borat in that both are about blinkered males who can’t help being sexist and racist — there’s no malice in it, it’s just the way they are reflexively. Borat, however, was used partly as an instrument to draw out American sexism and racism: he would say something offensive, and Americans would genuinely agree with him. There’s nothing like that here, so there’s no satirical bite to Aladeen’s worldview. He just behaves predictably indefensibly in scene after scene. The same point is made over and over. Baron Cohen performs with his usual gusto, but he’s acting in a self-made vacuum. If it were anyone else in the role, and if The Dictator weren’t riding on the audience good will left over from Borat and (to a lesser extent) Bruno, it’d be a complete flop. Some oddball touches lift the satire a bit: the movie seems both amused and obsessed by the notion of powerful political figures renting the sexual favors of celebrities. (We know from the ads that Aladeen buys Megan Fox’s attentions, but the real joke is his wall covered with Polaroids of other stars, including a hilariously shamefaced former politician. There’s also a cameo by a fairly random star who must be a good sport, or a fan of Baron Cohen.) But by now, what looked like good dirty fun, a funhouse mirror pointed at America, has calcified into easy shtick. Baron Cohen can’t do his covert-op comedy any more — he’s too easily recognized — but he’s got to come up with something other than “guy with funny accent comes to America” if he doesn’t want Borat to be his peak. He reportedly has other things on deck, including a movie about Queen frontman Freddie Mercury, and that might be a fine vehicle for Baron Cohen’s fearlessness and high energy level. But the next time he and his coterie come up with a one-joke premise like The Dictator, they’d do well to confine it to a short film on Funny or Die — indeed, that’s how Borat, Bruno and Ali G started, in short segments on Baron Cohen’s TV show — instead of stretching it to 83 minutes. If there’s anything remotely goth-flavored in our culture untouched by Tim Burton and Johnny Depp, just wait a while; they’ll get around to it. Their latest collaboration, Dark Shadows, checks off “vampire” on the Burton/Depp wish list, a mild disappointment for those of us who’d hoped to see them remaking London After Midnight someday. (People remake well-loved films all the time; why not remake one few living souls have ever seen?) Following the lead of its forebear, the 1966-1971 supernatural soap opera, Dark Shadows doesn’t stop at bloodsuckers; it also throws in a witch and — rather randomly, I thought, and with little explanation — a werewolf. It is not the loosey-goosey fish-out-of-water farce the ads lead you to expect, though it’s far from serious — this may be the only live-action film I can recall in which a climactic explosion is a perky magenta. Indeed, the look of Dark Shadows is intriguing; it’s the strangest-toned mainstream film out there right now. The stock appears slightly faded, as if it were aping both the left-out-in-the-sun graininess of ’70s cinema and the wretched video quality of the old show. It all coalesces into a uniquely anti-goth palette (and the opening credits, too, are bland enough to be part of the joke). Into the tackiness of 1972 comes Barnabas Collins (Depp), cursed to vampirehood by scorned witch Angelique (Eva Green) two hundred years ago. Freed from his coffin/prison, Barnabas shows up at Collinwood Manor, now occupied by a dysfunctional family headed by disdainful matriarch Elizabeth (Michelle Pfeiffer). Burton and screenwriter Seth Grahame-Smith (Abraham Lincoln: Vampire Hunter) shoehorn as much melodrama and as many subplots into Dark Shadows as an hour and fifty-three minutes can hold. I suppose they’re trying to get as much of the original show into the movie as they can. Too young to have been one of the fabled kids running home from school to catch Dark Shadows on ABC, I prepared by popping in a DVD of nine “fan-favorite” episodes. After the first one, which introduced Jonathan Frid as Barnabas a year into the show’s run, my attention wandered elsewhere. You had to be there at the time, I guess. 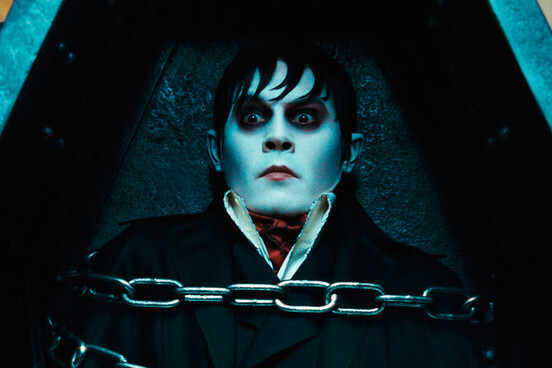 Frid played Barnabas as a melancholy romantic anti-hero, and Depp — looking like a cross between Count Orlok in Nosferatu and Conrad Veidt in The Cabinet of Dr. Caligari — follows suit; though the script makes the new Barnabas boggle his eyes at the trappings of 1972, Depp mostly stays away from easy laughs (he gets them anyway, largely with his sly inflections). He brings out the tragedy and anger of Barnabas’ situation. Barnabas’ main antagonist is Angelique, who’s stayed around all these years to put the Collins fishing cannery out of business. I can’t quite decide if Eva Green’s scenery-gnashing performance is great or terrible or both, but whatever it is, it’s memorable. Aside from Green, this is one of the more eclectic casts in a Burton film in a while, the standout for me being Helena Bonham Carter as the live-in shrink for the troubled little David Collins. She seems to be channeling an unholy combo of Jacqueline Susann and Fran Lebowitz, with a pre-punk orange wig topping everything off. Burton certainly has found his muse. Dark Shadows isn’t top-tier Burton, but he remains a classical director who trusts the image (some would say to the exclusion of anything else). It’s a pleasure to watch a film that isn’t over-edited, that basks in elegance. The blood, as in Burton’s Sleepy Hollow and Sweeney Todd, is bright Hammer red. The movie is more or less what you’d expect a Burton Dark Shadows to be, only with less emphasis on the purple-on-black color scheme and a lot of Super Sounds of the ’70s — including Alice Cooper as himself, performing two songs at a Collins mirrorball party — fighting Danny Elfman for dominance on the soundtrack. It turns into a bit of a mess towards the finish line, but at least it’s a fun mess, and if you’re looking to Tim Burton for narrative tidiness you must be thinking of another Tim Burton. The Avengers — or, as the onscreen title has it, Marvel’s The Avengers — is perhaps the most purely fun and frisky superhero movie since Christopher Reeve put on the red cape in 1978. (The Dark Knight was dazzlingly accomplished, but “fun” isn’t the first word I’d use to describe that brooding crime thriller.) Marvel Studios has been building towards this film for four years, starting with Iron Man in 2008 and continuing with The Incredible Hulk, Iron Man 2, Thor, and Captain America. Nick Fury (Samuel L. Jackson), commander of the spy mega-agency S.H.I.E.L.D., has showed up portentously in all those movies, and here he assembles the aforementioned heroes, plus S.H.I.E.L.D. agents Black Widow (Scarlett Johansson) and Hawkeye (Jeremy Renner), to do battle with an alien army commanded by Thor’s evil brother Loki (Tom Hiddleston). Got all that? Once the set-up is out of the way — and I’ve no idea how much of it will fly over the heads of viewers who missed the previous five films — The Avengers settles into a pleasantly lighthearted combat mode. The stakes are high, but writer-director Joss Whedon (Buffy the Vampire Slayer) never met a quip he didn’t like, and his familiarity with decades of Marvel comics shakes out as a kidding, don’t-take-this-too-seriously approach to the characters, all of whom get to be tersely witty in the Whedon tradition. This is the best writing any of these heroes have enjoyed onscreen; there’s not much of what’s pejoratively called “comic-book dialogue,” and most of that is dispensed with at the start. After that, it’s regular people with superpowers or super-tech putting on their game faces and working as a team. 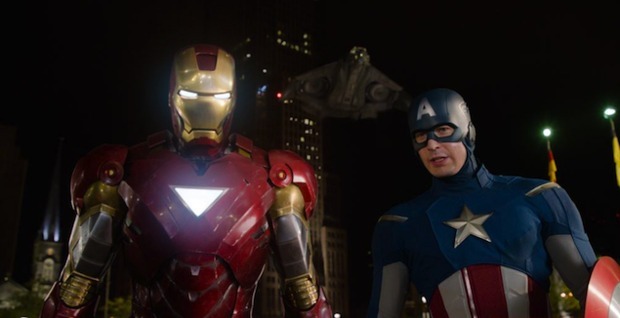 For comics fans, it’s an undeniable thrill to see Captain America and Iron Man in the same frame. Additionally entertaining is seeing Chris Evans and Robert Downey Jr. in the same frame, rubbing each other’s nerves raw and ultimately arriving at a grudging mutual respect. Mark Ruffalo’s Bruce Banner, who under duress turns into the rampaging green Hulk, is deceptively laid-back; it seems Banner has developed a bit more control over his transformations, but we still get plenty of crowd-pleasing footage of the Hulk leaping around and bashing the enemy. At its best, The Avengers is like one of those giant-sized Marvel Treasury Editions they used to issue in the ’70s, with the massive conflicts playing out in clean broad daylight. At some points the swooping camera shows you two or three epic fights going on at once; everyone gets his or her turn in the spotlight. Whedon, whose only previous film as director was Serenity, keeps the fun coming as if nothing at all were riding on it — not millions of dollars, not the hot expectations of fanboys. Whedon understands that this stuff is outlandish and ought not to be taken with monkish sobriety. Most of these heroes — including Captain America, Thor, and the Hulk — were co-created by legendary comics artist Jack Kirby (who also had a hand in Iron Man’s design). The Avengers does full honor to Kirby’s work, even if Marvel hasn’t; last year Kirby’s heirs were denied any of the billions that Kirby’s creations have generated for the company. Some people (rightly) incensed by the raw deal Kirby got have called for a boycott of The Avengers, and I do sympathize, though denying yourself the chance to see a Kirby-esque adventure writ large (and in 3D, though, as with the other 3D Marvel films, 2D is just as good) would be self-punitive and a drop in the bucket besides. Overall, this is as smooth and sprightly a franchise machine as we’re likely to get this summer; even at two hours and twenty-three minutes it goes like lightning. It’s brawny but punches fast, yet not so fast that we can’t see anything. Jeremy Renner’s Hawkeye shoots arrows into his targets without even looking at them; Scarlett Johansson’s Black Widow comes out the best under Whedon’s jurisdiction, gaining a sense of humor and a similar suave disregard of her own combat skills. The Avengers never overplays its hand (though the marketing machine sure has); everyone in it is smart, using strategy rather than brute force, though the force is certainly brutal when called for. If every superhero movie we’re about to get for the next decade were as loose-limbed yet tightly-wrought as this one, I’d have no cause for complaint; they won’t be, of course, but at least this one is.